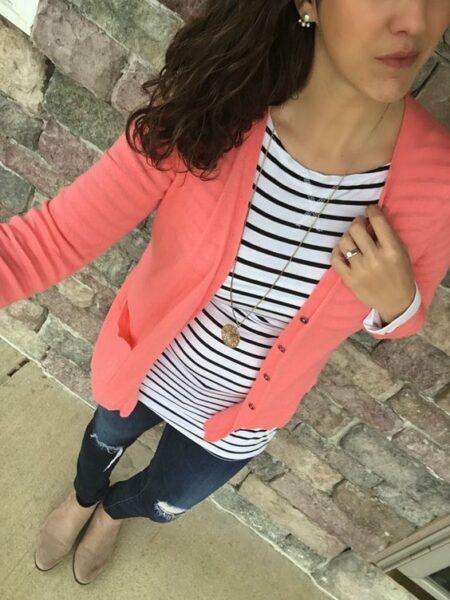 How to wear coral cardigan and what to combine with? | KSISTYLE! 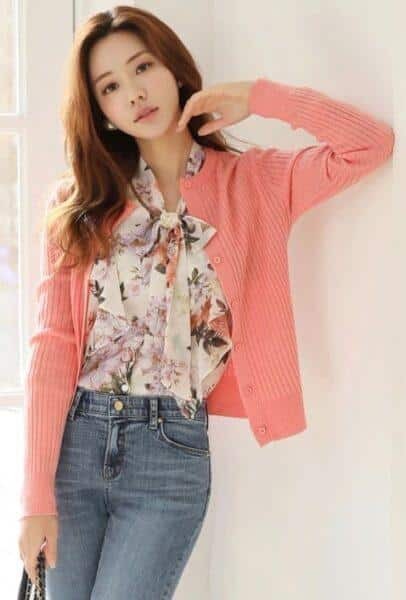 Don’t be surprised if you find a coral cardigan in plain sight in a boutique – fashion trends of 2019 suggest making this choice. Among gray, black and beige cardigans it looks more attractive, a lot of femininity and romance are concentrated in it. And no boldness! «Living coral» is a main shade of 2019 named Pantone by Color Institute. This color actively manifested itself in the fashion shows of «spring-summer 2019″. When it becomes warmer, this cheerful color will be everywhere in the streets of the cities – mass market brands have completed their collections with clothes and accessories of coral and peachpuff shades. 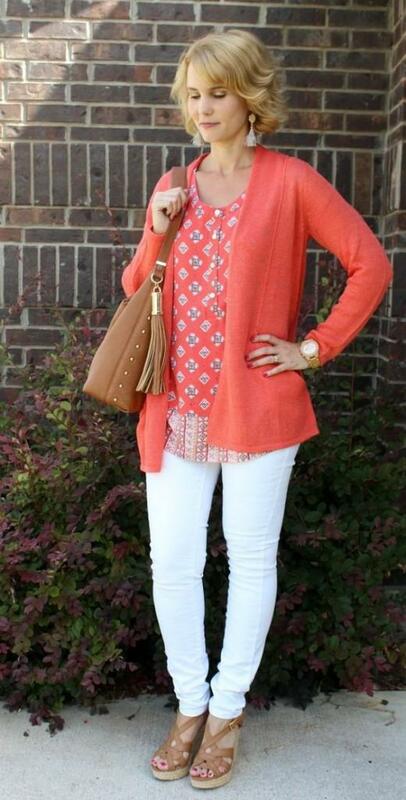 One of the easiest ways to adapt the trend and to make your outfit brighter is to buy a coral cardigan. Due to the similarity of shade with a well-known juicy fruit, people often call it peachy cardigan. Expert-stylists identify peachy and coral color by certain criteria but for most women this isn’t so important. Natural fabrics are optimal for spring and summer evenings, and thin, translucent knitting. Also you should pay attention to models with shorten sleeves. Loose-fitting cardigan of thick yarn will warm you in autumn and winter. Many models can be regarded as «casual» and comfort of the clothes is the most important. Its distinctive features are a simple silhouette, pockets and buttons, elements of sport style, original design solution (cardigans with hood or collar). 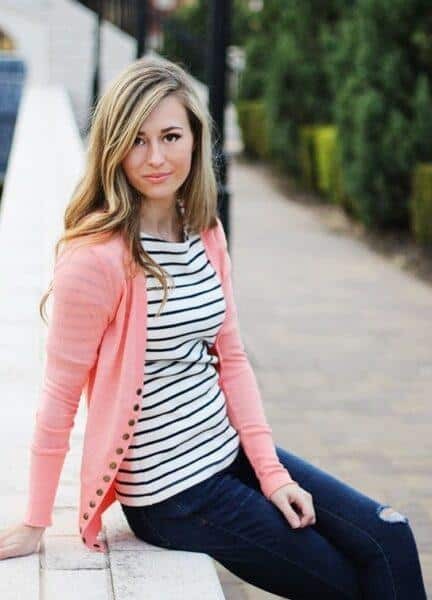 Romantic cardigans are becoming more and more popular. 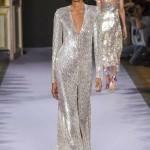 They are characterized by feminine fitted silhouettes and decor: accessories, embroidery, fringe, lace. 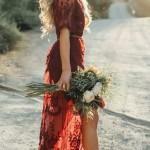 In 2019, the “bohemian” and vintage style are especially popular. Coral cardigans are represented in different lengths. In 2019 the most relevant models are just above the knee – they fit the outfit of casual style, can be combined with dresses and sundresses. The classic length below the belt also does not go out of fashion – it’s suitable for office and official meetings. 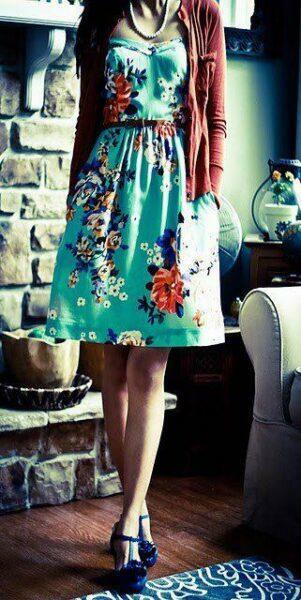 Shortened cardigans should be put away in the closet or only wear with dresses with high waist. Coral cardigan is suitable for afternoon walks or you can wear it in an office without strict dress code. In the evening this piece of clothing can be worn for a romantic date if you add a light dress, a thin belt or a small bag. This is a bright, warm, self-sufficient color, and therefore it looks best in warm weather. Coral shade can be described as a rich orange with an admixture of white and pink. Color nuances can change: color temperature, intension, depth of tone. The color can be cold, with a slope of pink or red, or warm — with a slope of peach and orange. The choice of a shade should be based on the color type, which is formed from a combination of color of skin, hair and eyes. Whom does coral cardigan suit? Bright, rich shades of coral suit girls with a “warm” color type: golden or peach skin, hair with a golden sheen. If your type is «cold» (very light skin, dark or light hair with ashy seen), then you should wear pink or light shades of coral. 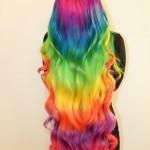 The most advantageous coral color looks on blondes and girls with light-brown hair and with tanned skin. Raven-headed women are advised to pay attention to darker shades of color or try on a red cardigan. 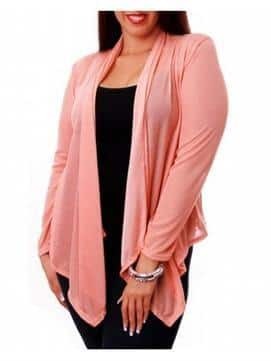 Can plump women wear coral cardigans? The answer is yes. But they should pay attention to long asymmetrical cardigan. You should choose thin not loose material. 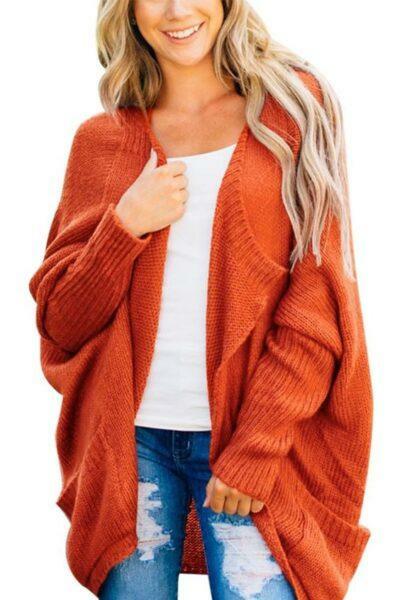 The cardigan should cover the upper part of thighs. All the secrets of choosing a cardigan for plump women are described in a separate article. All pastel colors can be combined with light coral shade: pastel-blue, pink, lilac, minty. It is necessary to refuse dark deep tones ( wine, dark gray, dark green). Black clothes can be combined with a coral cardigan of a darker shade. 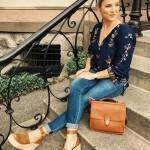 Fashion bloggers often prefer «oversized» cardigans or long and loos, not fitted models. They are comfortable to wear and can be combined with things of any style. They look good with skinny jeans and flat shoes: sneakers, massive trainers, loafers and flats. 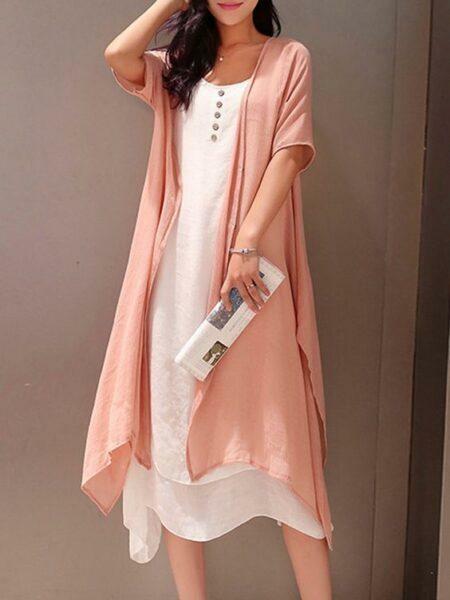 Yet thin cardigans of coral color are represented in large numbers because light peachy-pink colors are more suitable for spring and summer. - Classical jeans are cross-functional piece pf clothing. Coral color matches pastel blue, white, gray and blue jeans. You can choose jeans shorts as an alternative variant. You can complete your look with light top. A successful trio will be provided by pink, blue, mint, white or gray. 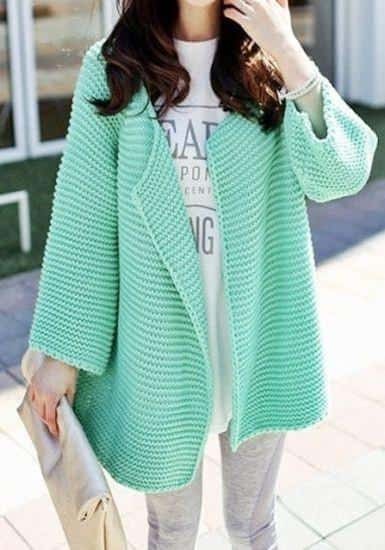 See how to wear a mint cardigan. - In autumn you can wear a peachpuff cardigan with dark trousers and with a wrap scarf. - White has been an absolute favorite of stylists for several seasons. You can refresh your look with white T-shirt, blouse or dress, worn with a coral cardigan. At the same time you can combine a cardigan made of any fabric with a white top: natural and reclaimed wool, cotton, chiffon and lace. You can finish the complement with shoes of beige, light-gray, clue, white color or with jewelry (coral matches perfectly with gold and turquoise). - Floral design will complete gently and feminine look. Large and small flowers look best of all on a white, turquoise, beige background. - The classic strip will make the ensemble more playful and informal. Add a regular striped T-shirt to your cardigan. 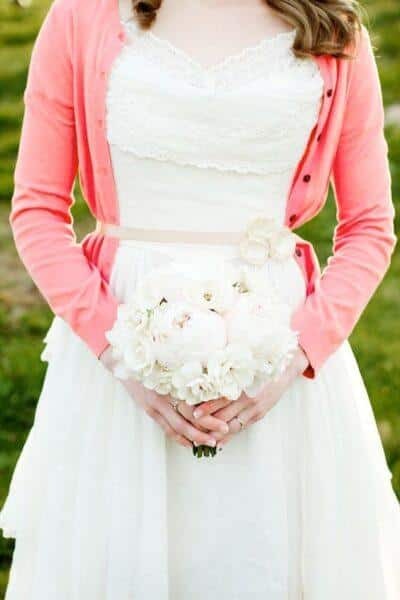 - The best combination: a coral cardigan and a romantic dress of any length. Midi is best combined with knee-lengths cardigans. They will also polish the skirt that is too short, making the image more sophisticated. The question of what to wear a peach cardigan with, can be solved with a standard basic set. If the article was useful to you, tell your friends about it by clicking the buttons below!